In the last few years we have seen a shift with business no longer asking why women’s representation is so important but how they can make gender diversity a reality. This is a positive step forward, however the reality is that progress in women’s representation at executive level remains woeful. 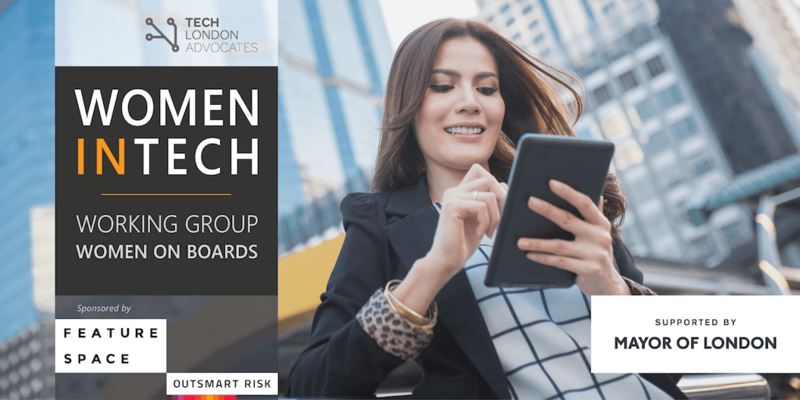 A recent report by Cranfield showed that women’s representation at Executive Committee level in the FTSE 100 was 19.4% of Exec roles, similarly look at the number of female CEO’ within the FTSE100 – a grand total of 7. If we are to see sustained gender diversity at the top of business then more must be done to ensure women progress through the executive pipeline. That is why On Monday 5th December, Tech London Advocates Women in Tech descended on City Hall’s Living Room for their final working group of the year focusing on the insights and tips to pave our way to the Boardroom. The Deputy Mayor for Business, Rajesh Agrawal, warmly kicked off the evening welcoming guests. What better way to set the scene than hearing how City Hall are not just talking the talk but walking the walk towards gender parity. We were thrilled to hear The Mayor has appointed an even split of female and male Deputy Mayors as well as re-configuring the TfL advisory board to include over 50% women representatives. TLA Women in Tech have always promoted – be clear on your own stats & your data. City Hall have done just that and published results of their gender pay audit, which shows a significantly lower pay gap at around 4.6 % compared to the London-wide industry. They have now tasked their Equalities Taskforce to produce an action plan to ensure there is no gender pay gap whilst also providing the infrastructure & support to HR Policy, learning & development and work culture. City Hall are also looking outwardly to actively see what more they can do to support and share best practices with all business in London to support them to make the right changes. Get really clear on your strengths, focus on your ‘specialism’ and then align your own brand with those strengths. Talk about your brand and what you are really all about. Inspired and fuelled with passion – we were then put to work (it is a working group after all!) as we went through a highly interactive coaching session with TLA Co-Founder, Nikki Watkins. Nikki challenged us to take on ‘male characteristics’ – how we stood (feet apart, superman pose), how we walked (with speed and purpose) and how we greeted each other (from forceful handshakes to many ‘High-Fives’!). We often overlook the way we present ourselves and it was through this session we gained awareness on exactly that – Executive Presence, how we walk, talk and interact to align with ‘our brand’. In roundtables of 10 we delved into a self-assessment rating components of Gravitas, Communication and Appearance and discussed the results in pairs. Feedback was often surprising, again highlighting the benefits of being self-aware and truly ‘present’ in any scenario. We then took that self-awareness and applied it to what we thought we were doing as individuals & as Boards to sabotage our own success. Suggestions came in thick and fast with ‘Not being your true self’, ‘Expecting more of ourselves’, ‘Apologising’, ‘Women not looking out for each other’ Vs ‘All male boards less attractive to join’, ‘Boards tended to recruit from the same talent pool’, ‘Perception of boys club at Board level’, ‘Boards expect more from women than men’. We wrapped the evening up with the prominent reminder ‘If your presence doesn’t make an impact, your absence won’t make a difference’. Our final working group of the year couldn’t have been possible without the support of our sponsors Featurespace Ltd, our strategic partners Tyche Leadership Consulting and Nexec Leaders plus the fantastic support of City Hall. As our community grows we are excited about 2017 and look forward to driving actions for gender parity. So, as we head into 2017, what impact do you want to make?